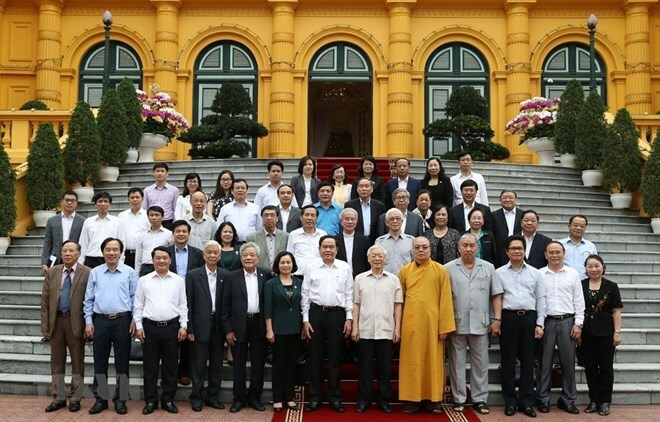 Party General Secretary and President Nguyen Phu Trong on April 10 emphasised the important role of the Vietnam Fatherland Front (VFF) in strengthening national solidarity, building unity, and bringing the support of foreign nations into full play. Meeting with the VFF Central Committee Presidium in Hanoi on April 10, Trong exchanged views with presidium members on several issues related to corruption fight, how to improve the business and investment environment, methods of attracting more resources from overseas Vietnamese, and encouraging revolutionary veterans and intellectuals to participate in policy consultation and criticism. VFF Central Committee President Tran Thanh Man said that last year, dissemination work was reformed, with the collection of people’s ideas and aspirations to be submitted to Party and State offices implemented more effectively. The VFF collected a total of 6,943 ideas and proposals from people across the nation which were reported at the fifth and sixth sessions of the 14th National Assembly. Campaigns such as “All people unite to build new-style rural areas and civilised urban areas” and “Vietnamese people prioritise made-in-Vietnam products” attracted widespread active participation, Man stated, adding that many people took part in movements to support disadvantaged people. This year, the VFF will prioritise work in understanding people’s aspirations, solving urgent issues arising in the community, speeding up patriotic emulation movements to fulfill socio-economic development goals, and increase the quality of social criticism and supervision.